DR Congo striker Dieumerci Mbokani has pulled out of his country's squad ahead of their 2019 decisive Africa Cup of Nations qualifier at home to Liberia due to injury. The 33-year was included in a 24-man squad selected by the Leopards coach Florent Ibenge for the decisive Group G match in Kinshasa on 24 March. Mbokani, who currently plays for Belgian club Royal Antwerp, had been due to have marked his return to international football after just over two years break. "Dieumerci Mbokani will not be available following a meniscus (knee) injury according to medical sources from his Belgian club Antwerp," the DR Congo football federation said on their website. The former Norwich City, Hull City and Monaco player has now been replaced by Godmerci Ndongala, who has scored four goals in 28 appearances in the Belgian top-flight so far this season for Genk. Mbokani, briefly quit international football in April 2016 after the DR Congo Federation threatened to ban him for missing two 2017 Nations Cup qualifiers. But he resumed his career with the Leopards later that same year and went on to play at the 2017 Nations Cup in Gabon, which was the last time he wore his national shirt. 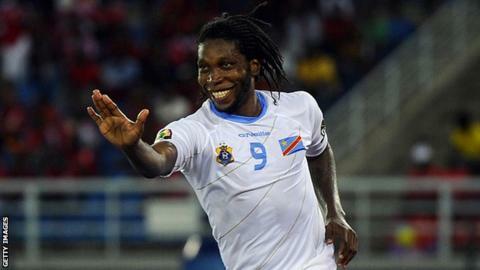 Mbokani has scored 18 goals in 40 appearances for DR Congo, including at three consecutive Nations Cup tournaments from 2013 as he helped his country to a third place finish in 2015. DR Congo must defeat Liberia to stand any chance of qualifying for this year's finals in Egypt. Group leaders Zimbabwe are on 8 points followed by Liberia on 7, DR Congo have 6 and Congo Brazzaville 5. Ibenge has also handed recalls to defenders Padou Bompunga Botuli of AS Vita club and Merveille Bope Bokadi who is based in Belgium. Other notable absentees are Gael Kakuta who plays for La Liga side Rayo Valencano, Turkey based Wilfred Abro Moke and Neeskens Kebano who is with Premier League club Fulham. Star players Yannick Bolasie - currently on loan to Belgian side Anderlecht from Everton - and China based Cedric Bakambu are also among regulars included.